Lee Lauderback is President and CEO of Stallion 51 Corporation located at the Kissimmee Gateway Airport, Florida. For over 30 years, Stallion 51’s innovative and comprehensive curriculums have instructed thousands of pilots on the correct and safe methods of flying both the legendary P-51 Mustang and the historic T-6 Texan. Lee has been the chief flight instructor since Stallion 51’s inception amassing over 22,000 flight hours in all types of aircraft including well over 9,500 hours in the Mustang. He is a certified single and multi-engine flight and ground instructor, holds an Airline Transport Pilot certification as well as instrument, helicopter and glider ratings. His expertise and vast experience in both the corporate and private aviation has earned him the distinction of being an FAA Experimental Aircraft Examiner. Lee is a member of the Society of Test Pilots (SETP) and is often called upon to flight test various Vintage planes, helicopters and Turbojets before they are accepted. In 2016, Lee became a member of the Society of Experimental Test Pilots (SETP); an exclusive group of exceptional pilots such as R.A. “Bob” Hoover and Hoot Gibson, who nominated Lee to the organization. In 2017, the Federal Aviation Administration’s (FAA) recognized Lee Lauderback for his 50 plus years of safe flight operations and his many contributions to aviation safety with the Wright Brothers Master Pilot Award Program (MPA). Lee Lauderback is also the recipient of the 2017 International Council of Air Shows (ICAS) Sword of Excellence. ICAS’s Sword of Excellence Award recognizes and honors Lauderback’s 30 years of experience flying P-51 Mustangs and his commitment to aviation safety. This award recognizes the recipient’s selfless commitment to improving and contributing to air shows and is the highest honor an individual can receive in the air show business. Lee started flying sailplanes at age 14 and launched his corporate aviation career immediately after college with the top flying noted professional golfer, philanthropist and businessman, Arnold Palmer. Lee was Mr. Palmer’s chief pilot and the director of flight operations for 17 years, flying several different models of Citation jets, a Learjet and a MD500E helicopter. 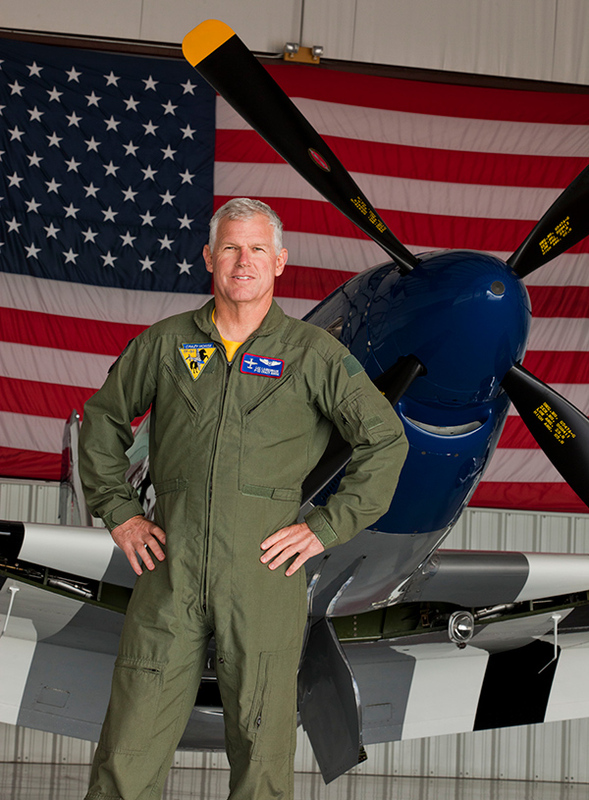 Lee has expanded his aviation knowledge and experience to include flying the F-15 Eagle, F-16 Viper, F/A-18 Hornet and test flown the Hawker Beechcraft T-6 Texan II. He also has over 2000 hours in sailplanes and has competed in many soaring contests and has held several sailplane records. Currently, Lee performs his Signature Solo Mustang Routine at air shows around the country. Lee was one of the first civilian pilots for the USAF Heritage Flight program which showcases historic WWII military aircraft with current USAF military aircraft in unique formation flight. For many years, Lee has also instructed students at the Navy Test Pilot School in Patuxent River, Maryland. Lee is a graduate of Embry-Riddle Aeronautical University in Daytona Beach with a degree in Aeronautical Science and Business Management. Lee is also a Master Falconer and when not flying himself he can be found flying hawks and falcons. WHAT ARE YOU WAITING FOR? COME FLY WITH US!